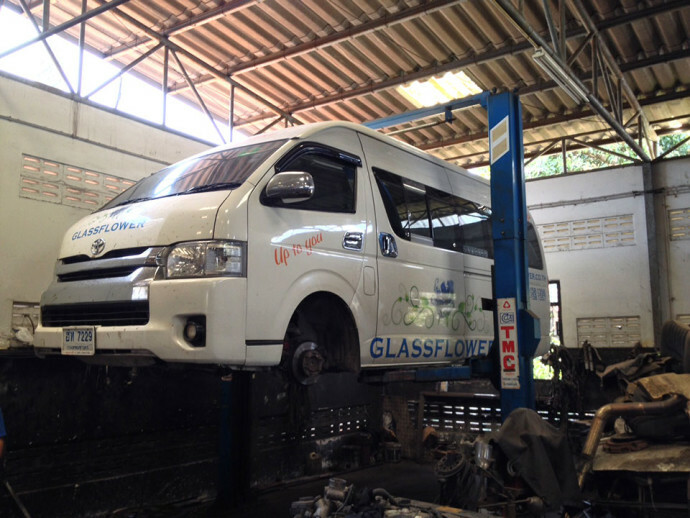 At Glassflower we maintain and service our vehicles to the highest satefy standards in the industry and at scheduled intervals. Safety is not only first, it foremost. In addition to thorough monthly inspections, our vehicles are also inspected before each day/night of operation. Our driver’s daily safety check is called Basic SBT. Steering, Brakes, and Tires. No vehicle drives without passing a basic daily inspection by our experienced drivers. In addition to mechanical service and inspection, items such as the air conditioning of our vehicles are regularly serviced and to include air filter changes. Glassflower cannot and will not operate in the transport business without knowing our passengers are safe and well taken care of. We strive to be the best travel and transport company in Thailand. Without a serious appreciation of health and safety, we cannot fulfill our mission with any form of ethical integrity.